Herein, we elucidate that ligneous conjunctivitis (LC) was proved as an IgG4-related disease (IgG4-RD) by a series of pathologic studies from primary and recurrent episodes of an LC patient. 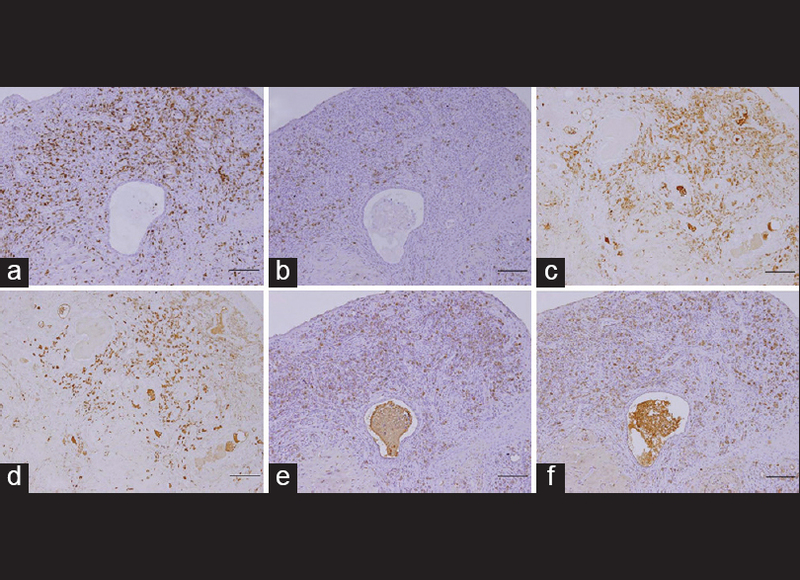 LC was diagnosed based on clinical presentation and pathological appearance; furthermore, combined with serological examination and immunohistochemical study, the case also conformed to the diagnosis of IgG4-RD. The IgG4-RD, broadly discussed in recent times, is an idiopathic disease entity with tissue fibrosis possibly involving multiple organs. To the best of our knowledge, IgG4-RD has never been reported with LC. By reporting the clinical course and literature review, we should pay attention to the association between these two diseases. The IgG4-related disease (IgG4-RD) is an idiopathic disease entity with tissue fibrosis possibly involving multiple organs. It is characterized by elevated serum IgG4 concentrations and tissue infiltration by IgG4-positive plasma cells, accompanied by tissue fibrosis and sclerosis. IgG4-RD has been broadly discussed in recent times, with a rapidly increasing understanding of the disease and its causes. In this case report, we show that LC may be an IgG4-RD based on the ocular pathological findings, clinical presentation, and serological tests. 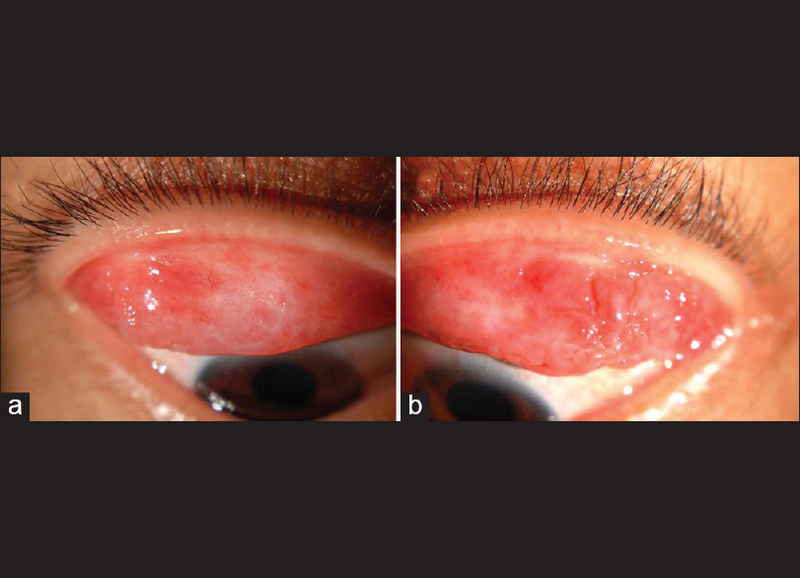 A 34-year-old woman presented with bilateral itching, redness, and mucinous discharge. Several bilateral woody hyalinized masses were identified on the tarsal conjunctiva [Figure 1]. She also had mucinous saliva; besides, a cyst partially limiting the vocal cord movement was identified over the right posterior cricoids. Neither did the patient have any contributory history of ocular trauma nor did any of her family members. Initially, unusual, varied-size giant papillae were found over the tarsal conjunctiva, and received mass excision 3 times, cryotherapy, triamcinolone injection (40 mg/ml), antiproliferative soaking with mitomycin C, and amniotic membrane transplantation because of medically refractory symptoms. Although symptoms were dramatically relieved after each surgery, the patient was always followed-up for tumor regrowth with associated discomfort for up to 1-2 years after each surgery [Figure 2]. Recurrent conjunctival lesions were assessed by immunohistochemical microscopy for serial samples of conjunctival biopsies. Pathological analysis confirmed the diagnosis of LC [Figure 3] and revealed the characteristics of IgG4-RD [Figure 4]. Combined with clinical presentation and elevated serum IgG4 level (274 mg/dl), IgG4-RD was further diagnosed. There was no obvious lymphadenopathy in physical examination and chest X-ray. Laboratory examination revealed that eosinophil (0.7%), rheumatoid factor (nonreactive), anti-nuclear antibody (negative), erythrocyte sedimentation rate (3 mm/h), C3 (98.4 mg/dl), C4 (15.3 mg/dl), IgG (1500 mg/dl), and IgM (230 mg/dl) were all within normal limit, but IgE (133 IU/ml) and IgA (531 mg/dl) were elevated. In this case, we found LC may be an IgG4-RD. To the best of our knowledge, IgG4-RD has never been associated with LC. In this case, LC was diagnosed by the patient's clinical and pathological manifestations. Her condition was also diagnosed as a definite case of IgG4-RD [Table 1]  because she met the clinical criteria (diffuse/localized swelling and masses in single or multiple organs), hematological criteria (serum IgG4 level: 274 mg/dl), and the histopathological criteria (marked lymphocyte and plasmacyte infiltration and fibrosis; infiltration of IgG4-positive plasma cells; ratio of IgG4-positive cells/IgG-positive cells >40% and >10 IgG4-positive plasma cells/high-power field). However, we cannot exclude the possibility that our patient had two unrelated diseases. A future study of more LC cases will provide more supportive evidence. As for the pathophysiologic correlation between LC and IgG4-RD, there is no literature available to illustrate the common features. 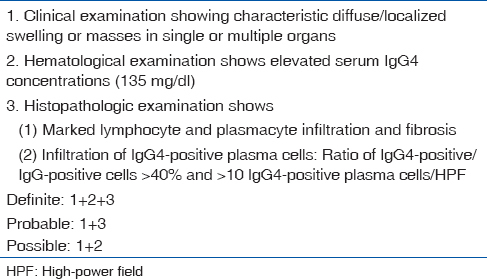 In LC, inflammatory cells, mainly lymphocytes and plasma cells, are typical histological findings;  on the other hand, lymphocyte and IgG4 plasma cell infiltration are the histopathological features in IgG4-RD. Thus, we postulate that lymphocyte and plasma cell may be the key roles for both diseases. LC may be an IgG4-RD with ocular mucosal (conjunctival) change, which has never been reported. Future studies with conjunctival biopsy for immunohistochemistry and determination of serum IgG4 levels in a larger sample of LC patients might conclusively elucidate whether LC is an IgG4-RD. Schuster V, Seregard S. Ligneous conjunctivitis. Surv Ophthalmol 2003;48:369-88. Umehara H, Okazaki K, Masaki Y, Kawano M, Yamamoto M, Saeki T, et al. 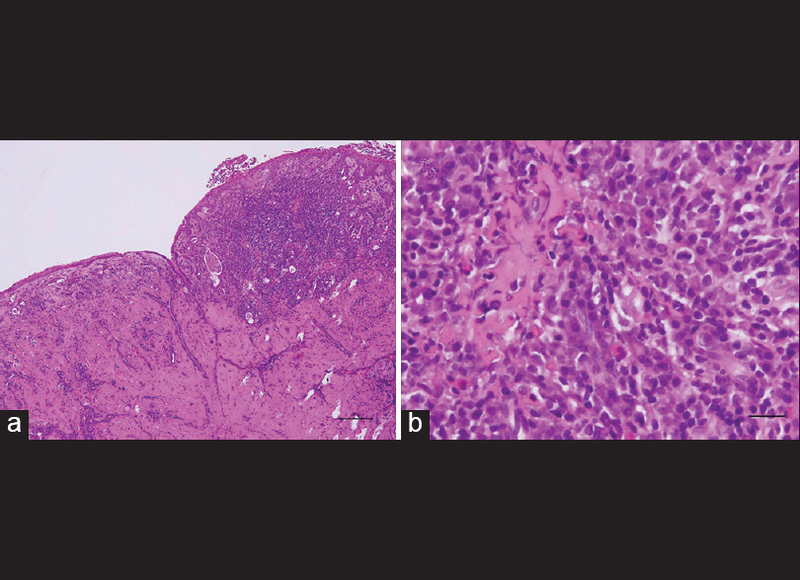 A novel clinical entity, IgG4-related disease (IgG4RD): General concept and details. Mod Rheumatol 2012;22:1-14. Meire FM, Claerhout I, Kestelyn PH. Use of mitomycin C and r-tPA for the management of conjunctival membrane and cataracts in a child with conjunctivitis lignosa. Br J Ophthalmol 2000;84:1204-5. Barabino S, Rolando M. Amniotic membrane transplantation in a case of ligneous conjunctivitis. Am J Ophthalmol 2004;137:752-3. Ku JY, Lichtinger A, Yeung SN, Kim P, Cserti-Gazdewich C, Slomovic AR. Topical fresh frozen plasma and heparin treatment of ligneous conjunctivitis in a Canadian hospital setting. Can J Ophthalmol 2012;47:e27-8. Hidayat AA, Riddle PJ. Ligneous conjunctivitis. A clinicopathologic study of 17 cases. Ophthalmology 1987;94:949-59. Shimabukuro M, Iwasaki N, Nagae Y, Nakagawa Y, Ohtori Y, Inoue Y, et al. Ligneous conjunctivitis: A case report. Jpn J Ophthalmol 2001;45:375-7. Nakashima H, Miyake K, Moriyama M, Tanaka A, Watanabe M, Abe Y, et al. An amplification of IL-10 and TGF-beta in patients with IgG4-related tubulointerstitial nephritis. Clin Nephrol 2010;73:385-91. Rodríguez-Ares MT, Abdulkader I, Blanco A, Touriño-Peralba R, Ruiz-Ponte C, Vega A, et al. Ligneous conjunctivitis: A clinicopathological, immunohistochemical, and genetic study including the treatment of two sisters with multiorgan involvement. Virchows Arch 2007;451:815-21.